During the 1990s, several spokesmen for trading card companies would sometimes promote cards of sports they did not play. 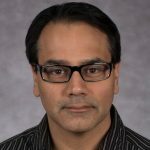 You had Eric Lindros on a Score baseball card, Rocket Ishmail on a Classic hockey card and Wayne Gretzky on an Upper Deck soccer card. 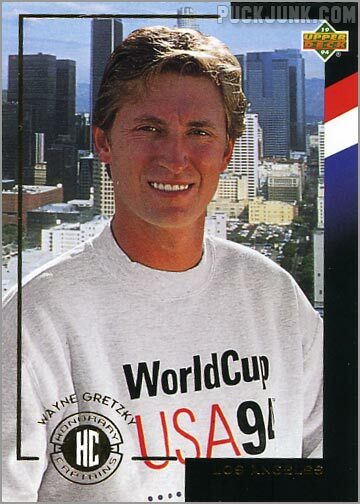 Because nothing — and I mean NOTHING — says soccer like Wayne Gretzky. 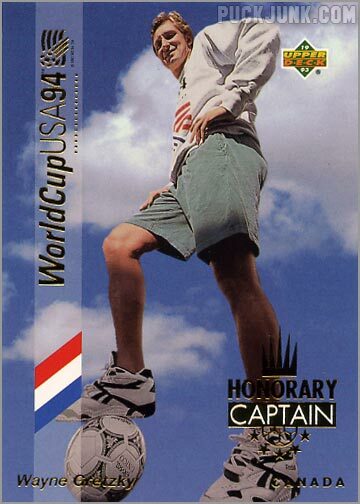 This particular card was released in 1993 as part of Upper Deck’s World Cup Soccer set and flew under my radar until recently. Ironic, since that was during the height of my card collecting days in the 90s. 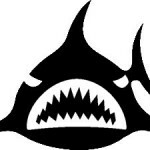 How did I miss this one? 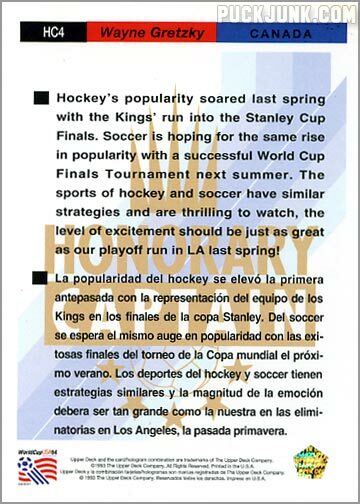 Hockey’s popularity soared last spring with the Kings’ run into the Stanley Cup Finals. Soccer is hoping for the same rise in popularity with a successful World Cup Finals Tournament next summer. 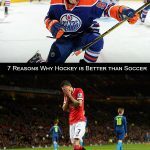 The sports of hockey and soccer have similar strategies and are thrilling to watch, the level of excitement should be just as great as our playoff run in LA last spring! Translation: Gretzky is a paid spokesman for Upper Deck. 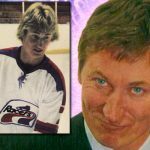 Gretzky plays for the L.A. Kings. 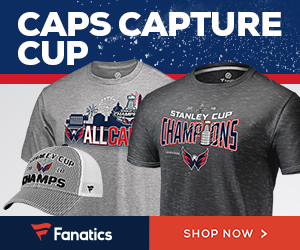 The L.A. Kings lost in the Stanley Cup Finals. Let’s hope the World Cup does better than the L.A. Kings. 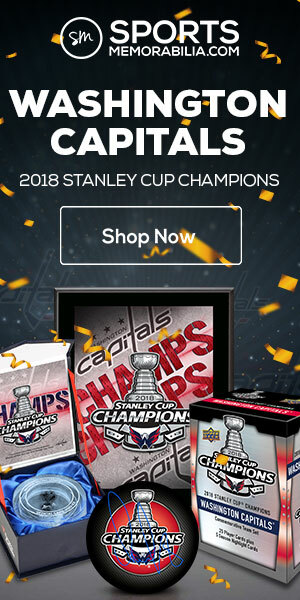 Oh — and buy our soccer cards! Worth noting is that there are two versions of these insert cards – the white bordered “regular” version and the full-bleed “gold” version that you see in this article. 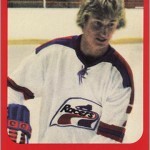 I’m not sure what good it did to shoehorn the greatest hockey player ever into a set of soccer cards. But Upper Deck must have seen some value to it, as Gretzky would later appear in Upper Deck’s second World Cup Soccer set, released in 1994 (seen at right). 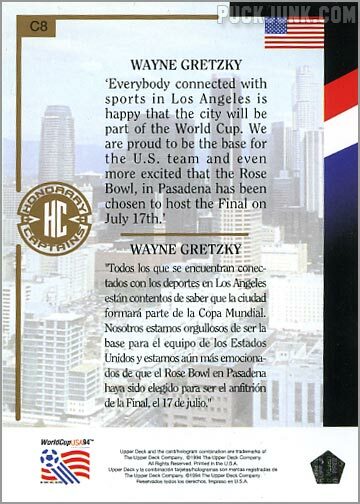 This time, Upper Deck assigned an Honorary Captain to each of the ten cities the tournament was to take place, with Gretzky representing Los Angeles. Translation: Some Marketing / PR guy wrote this and put Gretzky’s name above it.